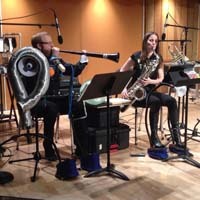 Bio: Popebama: Erin Rogers (saxophones), and Dennis Sullivan (percussion), NYC-based composer-performers, apply text, electronics, and high-energy instrumental writing to multi-instrument setups. Specializing in works conceived by Rogers, Sullivan, and composers such as Paul Pinto, Matthew Shlomowitz and Eric Wubbels, Jenna Lyle, Daniel Silliman, and Andrew Greenwald, the duo has performed on the Permutations, Home Audio, Avant Garasement and Sound Traffic Concert Series, with featured appearances at the Edmonton Fringe Festival (Canada), Diabolical Records (Salt Lake City), and the Inaugural VU Symposium (Park City, UT), most recently performing for an ecstatic crowd at the 2017 New Music Gathering (Bowling Green, OH). Popebama will be featured at the inaugural SPLICE Festival at the University of Western Michigan. Ensemble Bio: Popebama: Erin Rogers (saxophones), and Dennis Sullivan (percussion), NYC-based composer-performers, apply text, electronics, and high-energy instrumental writing to multi-instrument setups. Specializing in works conceived by Rogers, Sullivan, and composers such as Paul Pinto, Matthew Shlomowitz and Eric Wubbels, Jenna Lyle, Daniel Silliman, and Andrew Greenwald, the duo has performed on the Permutations, Home Audio, Avant Garasement and Sound Traffic Concert Series, with featured appearances at the Edmonton Fringe Festival (Canada), Diabolical Records (Salt Lake City), and the Inaugural VU Symposium (Park City, UT), most recently performing for an ecstatic crowd at the 2017 New Music Gathering (Bowling Green, OH). Popebama will be featured at the inaugural SPLICE Festival at the University of Western Michigan. Erin Rogers Tenor Saxophone Erin Rogers is a saxophonist, composer, and performance artist based in New York City. She has . . .
Dennis Sullivan Percussion Born in Akron, Ohio, Dennis K. Sullivan II is a percussionist, composer, performance artis . . .